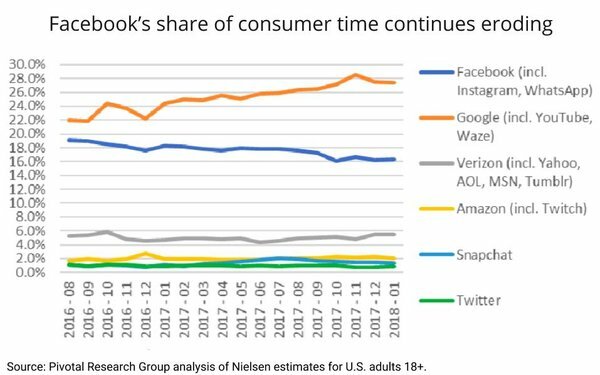 Even before the #DeleteFacebook campaign took root in the aftermath of the Cambridge Analytica revelations, Facebook’s share of consumer time continued to erode, according to an analysis of Nielsen data published this morning by Pivotal Research Group. “Our analysis of updated data on digital content consumption from Nielsen for January 2018 shows ongoing growth in digital consumption including substantial growth in share of consumer time for properties associated with Google and continuing erosion in share of consumption time for Facebook,” wrote Pivotal analyst Brian Wieser -- noting that overall digital content consumption was up by around 16% in January. Google properties -- including YouTube, Google and Waze -- accounted for 27.4% of all time spent on digital media, similar to its position in December 2017, but a significant gain over its 24.4% share a year earlier.